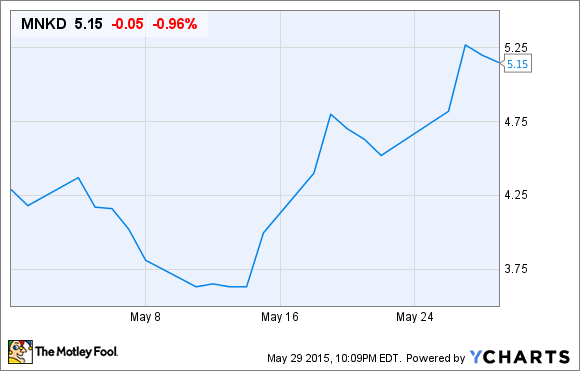 MannKind investors breathe a bit easier in May after Wall Street commentary eases their pain. Could this rally continue, or are skeptics still in firm control? What: Shares of MannKind (NASDAQ:56400P706), a biopharmaceutical company focused on developing therapies to treat diabetes, skyrocketed by 21% during its volatile month of May, based on data from S&P Capital IQ, after receiving positive commentary from a Wall Street research firm. So what: According to an analyst report released in mid-May by Shaunak Deepak, an analyst with Jeffries, demand for inhaled diabetes drug Afrezza, MannKind's only approved product with the Food and Drug Administration, should improve as physician awareness of the product improves and a planned advertising campaign gets under way. According to Deepak's own surveys, physicians who are aware of the drug are prescribing it more than he and his firm had first predicted, while 35% of physicians surveyed were completely unaware of Afrezza's existence. This opinion comes in stark contrast to JPMorgan Chase's Cory Kasimov who downgraded MannKind to "underweight" from "neutral" just a week prior to Deepak's commentary was released. Kasimov noted that while its sales in the first two months of $1.1 million were "predictably slow," it's been the hurdles in its early launch phase that could be difficult to overcome. Kasimov opines that the need for a spirometry test (which is not something most doctors have on hand) prior to being prescribed the drug could make it tough for the inhaled therapy to gain traction. Now what: So, who should you believe? On one hand Deepak could have a point with increased awareness being a big factor to boosting sales. Let's not forget that as an inhaled therapy, Afrezza is faster-acting and was shown in clinical trials to leave the body quicker than the control drug, which means even less chance of a hypoglycemic event. From a factor of convenience Afrezza could be a winner. Source: Afrezza users via Facebook. MannKind is also partnered with Sanofi (NASDAQ:SNY) in its launch and sale of the product. Sanofi has a very experienced global marketing team, so launching potential blockbusters is something they do with some regularity. On the other hand, the big concern I see is MannKind's valuation. Even presuming Afrezza manages to hit Wall Street's peak annual sales estimates of $2 billion (which would likely be seven to 10 years out), MannKind is only going to see 37.5% of sales at its peak. This works out to about $700 million per year. A number of recent biotech buyouts have been priced at roughly three times the peak annual sales estimates for the purchased company. In MannKind's case that would translate to $2.1 billion in value. As of this past Friday MannKind was worth... drum roll please... $2.12 billion. So where's the upside? Sure, MannKind has the opportunity to receive additional milestones which could boost its cash value and factor into its valuation a bit. Additional research and drug development could also come into play. However, with what I perceive to be little upside left in its shares and a mountain of launch risk still on the table, I'm inclined to side with JPMorgan's Kasimov on this one.